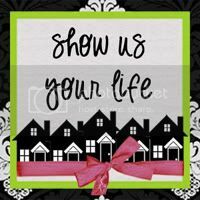 The "Show Us Your Life" topic this week at Kelly's Korner is favorite books. Obviously, I couldn't resist contributing a few favorites in our home. Here are some of our "ripped pages books," a sure sign of a book that has been well-loved and read often. Honestly, this is just a start...there are so many more that I could have included. What books would you include in the "ripped pages" category? By the way, if you are looking for "the best of the best," here are a couple of stellar book lists, provided by Fuse #8 of the School Library Journal. (A Fuse #8 Production is a great blog to follow if you want to be in the know about new children's book releases). 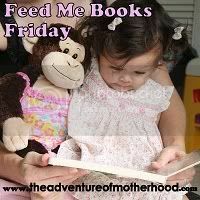 I'm also linking this post up to Feed Me Books Friday at The Adventure of Motherhood. My son loves the book "Dirty" but we don't own a copy...we had borrowed it from the library. Thanks for stopping by my place! I like all your fave books! 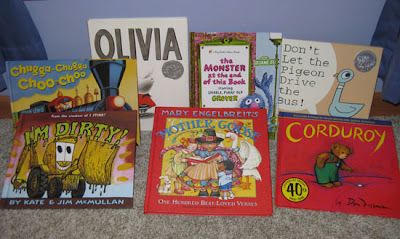 Oh, I need to find a copy of the Monster at the End of This Book for my new little man. It was one of my girl's favorites, but I think I let someone borrow my copy. Ooooh....we love Olivia and Corduroy too! Thanks for stopping by my blog! I'm going to have to follow up on your book reviews for when my little one comes around! I love the Monster at the End of This Book! And Fuse #8's top 100 lists are an amazing resource. My kids are older now, but they wore out The Nutshell Library when they were little. Who doesn't love The Monster at the End of the Book? It's a classic. Ha Ha the ones with ripped pages I feel you! I didn't get around to linky up with Kelly's Korner glad you did!